In our Final of the Tournament of Panelists II, five former Jeopardy! contestants were voted back onto this panel to discuss all things Jeopardy! Andy Saunders of thejeopardyfan.com moderates. 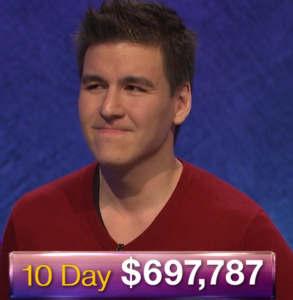 In the first of our summer hiatus episodes, Andy Saunders of thejeopardyfan.com brings back a few past panelists to irreverently discuss Jeopardy!. Jeopardy! stats for the week of April 10 – April 14, 2017, including winners’ totals and Tournament of Champions projections.